2018 Maruti Ertiga is finally here and the new Mahindra Marazzo is the first MPV we can think of to pit against the new Ertiga. Let's see how they rival in terms of specifications. The MPV segment in India is taking a new shape in India, with more premium and bolder offerings. A trend that was started by the Toyota Innova Crysta, led to the incoming of all-new Mahindra Marazzo, and most recently the new-gen Maruti Suzuki Ertiga. Launched at a starting price of ₹ 7.44 lakh (ex-showroom, Delhi), the new Ertiga is bigger, bolder, and more stylish & equipped than ever. The Mahindra Marazzo, on the other hand, has been another well-priced and very-well-equipped MPV, which was launched only a few months ago. 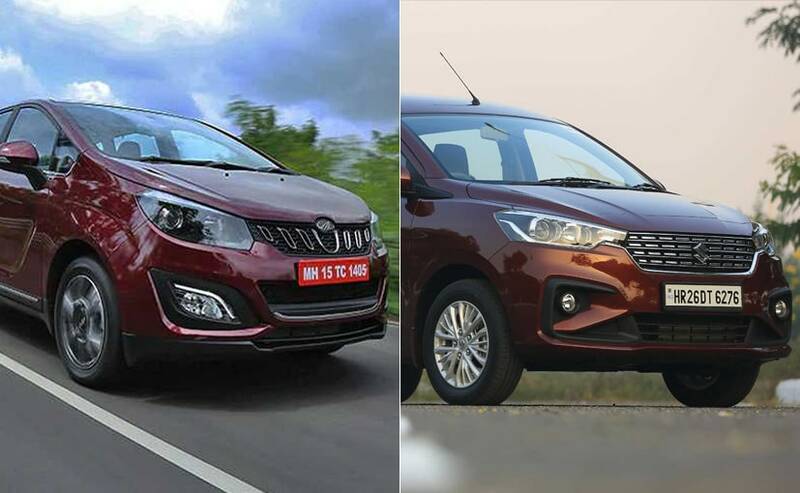 So, the question in our mind was, where does the new 2018 Maruti Suzuki Ertiga stand against the Mahindra Marazzo? Well, before we get a chance to do a real-world comparison, we thought of comparing the specifications sheets of the MPV first, so read on to find out which one is better, at least on paper. Mind you, the Marazzo only come in diesel version, so here we are comparing on the diesel models of the two MPVs. The 2018 Maruti Suzuki Ertiga is based on the new Heartect platform which also underpins the Swift, Dzire and the Baleno. While the Heartect is still a monocoque chassis, the one that underpins the new Mahindra Marazzo is a body-on-ladder frame. However, both the MPVs have a front wheel drive transmission. The 2018 Mahindra Marazzo in flesh exceeds over the all-new Maruti Suzuki Ertiga by quite a significant margin. 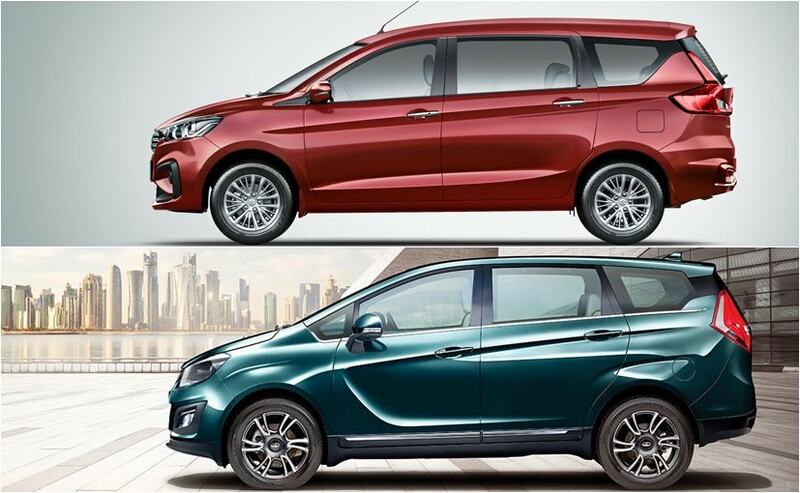 The Marazzo is 190 mm longer, 131 mm wider, 84 mm taller and has a 20 mm larger wheelbase than the Ertiga. 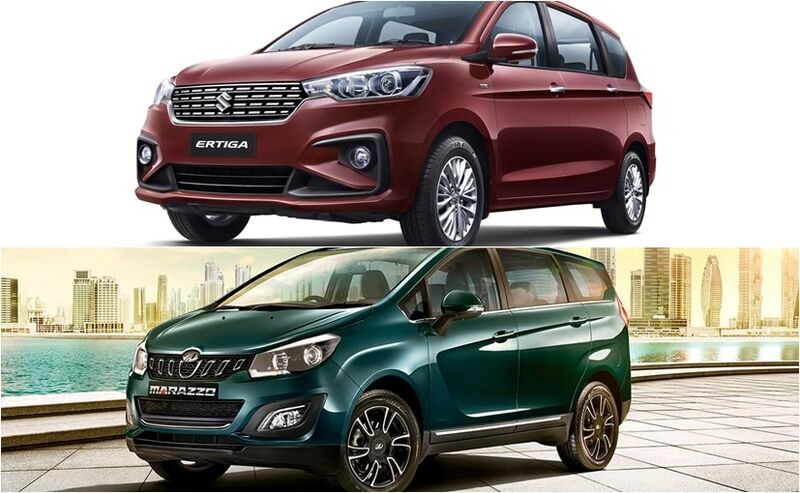 Also, the 2018 Ertiga is equipped with 15-inch wheels across variants while the 2018 Marazzo has 16-inch wheels in the M2, M4, M6 variants and 17-inch wheels in the top-end M8 trim. Speaking of the design the 2018 Maruti Ertiga looks butch up-front having a high hood line, wider chrome grille and larger bumper profile and other elements like the Volvo XC60 like c-shaped LED tail lamps and scooped tail gate makes the rear look rather attractive. The shark inspired Mahindra Marazzo too has elements like the shark tooth grille and c-shape detailing on the side going for it, however the overall proportions looks boxy. Larger dimensions have given the new Marazzo an edge even on the inside. The cabin of the Mahindra Marazzo is more spacious in all the three rows when compared to the 2018 Maruti Suzuki Ertiga. The material quality used in the 2018 Mahindra Marazzo feels more upmarket and some of the bits like the door-armrests are wrapped with soft-touch material. 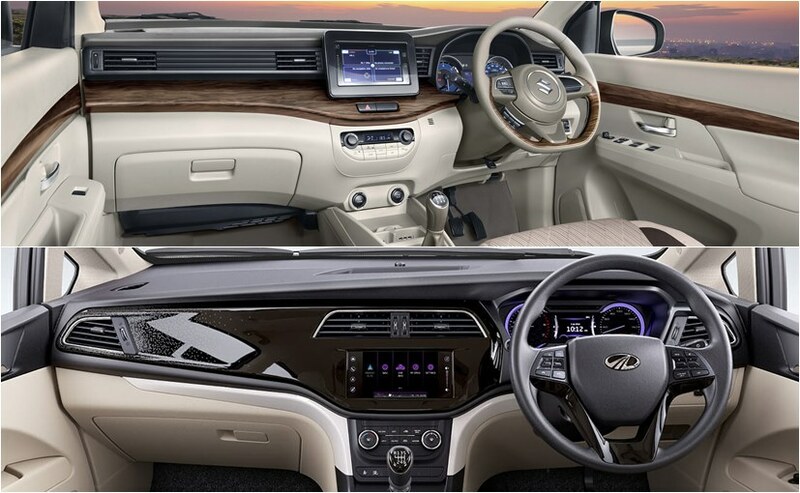 The seats in both the MPVs are well-cushioned and have good bolstering; however there is a scope of improvement in the under-thigh support in the Marazzo. Moreover, there are some flaws in the ergonomics of the Marazzo. For instance, the footrest beside the clutch pedal is placed too deep on the left and the central console has been positioned low and is hindered by the airplane like handbrake lever. There isn't any dedicated space to keep the phone and one on the dash needs an arm stretch to reach out to. The 2018 Maruti Suzuki Ertiga has grown in flesh compared to its predecessor and that has also added to the boot space. Interestingly, at 209 litres the Ertiga offers more boot space than the Marazzo's 190 litres with all the seats up. However, Marazzo's boot space can be expanded to 1055 litres while Ertiga's can be expanded to 803 litres. While the 2018 Maruti Ertiga is sold only in a seven-seat configuration, the Mahindra Marazzo gets seven or eight seat configuration in the M2, M4 and M6 variants. However, the top-end M8 even here is offered only in seven-seat configuration. Most of the features in both the MPVs are common like a 7-inch touchscreen infotainment system which is equipped with Apple CarPlay and Android Auto, HID Projector Headlamps, LED taillamps and more. However, some of them are missing on each end. For starters, the Ertiga lacks LED Daytime Running Lights (DRLs) whereas there isn't any engine start-stop button on the Marazzo. Also, the Marazzo's rear air-con runs the length of the 2nd and 3rd rows and has a diffuse function to dilute the air flow while the Ertiga has it in traditional fashion which is horizontally mounted on the roof. The 2018 Maruti Suzuki Ertiga still runs on a tried and tested fiat sourced 1.3-litre, four-cylinder DDiS 200 diesel engine which produces 88 bhp and 200 Nm of peak torque and is mated to a five-speed manual gearbox. On the other hand the Mahindra Marazzo gets a newly developed engine which is considerably more powerful. It is a 1.5 litre, four-cylinder engine which churns out 121 bhp and 300 Nm of peak torque and is mated to a six-speed manual transmission. An automatic is currently not available in either of the two and only the petrol Ertiga gets a 4-speed automatic gearbox. The Mahindra Marazzo has all surround disc brakes while the 2018 Maruti Ertiga gets disc brakes only in the front wheels and rear wheels are equipped with drum brakes. Speaking of the diesel variants, both Ertiga and Marazzo have 4 variants each and all the added perks in the Marazzo comes at a cost. It is significantly expensive when compared variant to variant to the Ertiga. While the base trim of the Ertiga diesel is ₹ 8.84 lakh, the Marazzo M2 is priced at ₹ 9.99 lakh. You go up all the way till the top-spec model and the difference between the prices of the Ertiga and the Marazzo is exactly ₹ 3 lakh, which a significant difference.